I’d like to be informed when there are new posts on the LCA website. I’d like to update my profile or change my password. I’d like to post an announcement or submit an event. How do I get my 6-month free trial access to the Sketch Engine? I’d like to access the Learner Corpus Bibliography. I haven’t received an invitation to join the LCB group. I’d like to search the Learner Corpus Bibliography. I’d like to search the LCB with Zotero Standalone. I’d like to contribute to the Learner Corpus Bibliography. A RSS feed will bring you the latest updates from the LCA website. 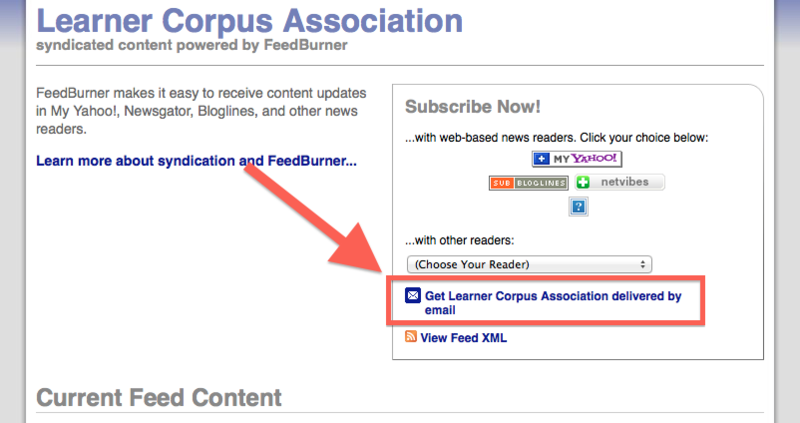 You can paste the following URL into your RSS reader: http://www.learnercorpusassociation.org/feed/. If you are not familiar with such a software, our feed is also available via FeedBurner. This free web service enables you to receive a daily email when new content is available. To edit the details of your user profile, hover over your username at the top-right of the site and click on “Edit My Profile”. This page enables you to update your academic details as displayed in the members’ directory. Feel free to upload a picture of yourself. LCA registered members can submit job offers, call for papers, upcoming events and other announcements via the “New” drop down menu located in the tool bar. All posts will be moderated before publication. You should send a receipt of proof of LCA membership payment to inquiries@sketchengine.co.uk. I no longer wish to receive notifications when there are new replies on the LCA Forum. Notifications are enabled by default when a new topic is launched, but you may unsubscribe from one or more threads at any time by clicking on the “Unsubscribe” link accessible within the topic itself. You can see all your subscriptions via the “Edit your forum options” menu. Please visit the Zotero LCB webpage and make a request to join the group: make sure you are logged in and simply click the “Join” button. Your request will only be accepted if you are a LCA registered member. Send us your references by email to contact@learnercorpusassociation.org. Please use the following template.